Part of the Science in the City project and the Valletta 2018 cultural programme is the AMaze2 labyrinth set up at Pjazza San Ġorġ. 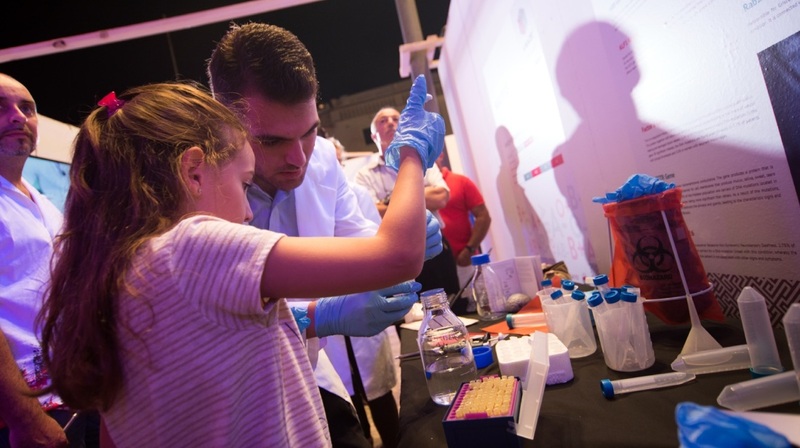 Science in the City, Malta’s Science & Arts Festival, promises the general public an interesting journey which is educational, scientific and also artistic. Part of the Science in the City project and the Valletta 2018 cultural programme is the AMaze2 labyrinth set up at Pjazza San Ġorġ. Designed by Logix Creative and Daaa Haus, AMaze2 offers visitors of all ages spectacular scientific installations with an artistic flair which are both informative and entertaining. The labyrinth houses a model of CERN’s Large Hadron Collider (LHC), a particle accelerator which speeds up protons to almost the speed of light. At such velocities, protons collide and this collision provides scientists insight into the nature of matter. The model LHC will function in a similar fashion by substituting protons with paintballs. The results are then analysed and explained to the public. This part of the labyrinth shall also feature interactive installations, headed by computer scientist Gianluca Valentino, which contribute to visitors’ understanding of the forces that govern our Universe. The Maze also contains an installation which takes visitors into the world of X-Ray Crystallography. Marking its anniversary since its inception a century ago, the installation, which is a collaborative effort between scientists, artists and ICT experts, demonstrates how the inner mechanics of our bodies work. Art group IZAXA is responsible for the artistic element of the piece together with Rosalin Bonetta, a biochemistry researcher at the University of Malta. AMaze2 also contains Biopilot 1.0 [Sound Modulation upon the Plant Model], a cross-disciplinary tech-biogarden installation, created by Mirjana Batinić. The platform, which is completely controlled by computers, allows guests to interact with sound-producing devices.